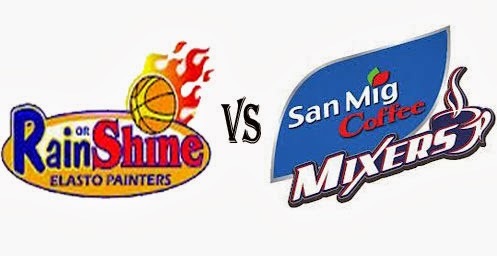 Watch the livestream broadcast of PBA Philippine Cup Finals Game 2 between San Mig Coffee Mixers and Rain or Shine (ROS) at the Smart Araneta Coliseum on Sunday, February 16, 2014. Can the San Mig Super Coffee Mixers tied the series up in Game 2 or will the Painters take a 2-0 advantage? In Game 1, Gabe Norwood inbounded the ball to a streaking Paul Lee with 1.6 seconds remaining as the Rain or Shine Elasto Painters defeated the San Mig Super Coffee Mixers, 83-80.